The Weekly Rider - Daniella Brasacchio - LA VELOCITA. Daniella Brasacchio is the Weekly Rider! When she's not riding she is works as a research scientist at Monash University in a Blood Cancer Therapeutics research group and loves her job. We've been riding with Dan for a few years now and watched her go from strength to strength... She keeps fit, very important for a type 1 diabetic. Sitting down to a meal made by Dan is always an event, she loves feeding others, preparing healthy meals for friends and family to enjoy. Drinking coffee and eating dark chocolate, my two guilty pleasures in life. About 5 years ago, I bought my husband a vintage Eddy Merckx frame for his birthday. He and a friend built it up and it is his second love, I am clearly his first (at least I hope!). We routinely drive out to the Dandenongs, and are super lucky to have this so close. I love the ‘Devils Elbow’ climb it is not easy but beautiful, especially when you turn left onto Churchill drive. To go faster! I am consistently trying to keep up with my husband and friends, it is a challenge but I am working on it. Fight through the pain, sometimes have a chat, and am continuously thinking. My thoughts are generally quite focused on one thing, my blood sugar levels, this is because I am type 1 diabetic. I generally think about my blood sugar levels, assess how many km’s and how hard I have ridden all to determine when I need to eat next. It’s a challenge but it doesn’t stop me from having fun on the bike. In fact, it is one of the reasons why I ride. How did your love for bikes come about. I came home from an overseas trip one year in 2008 and my husband said, we are both going to get road bikes. I like to keep fit and I had been encouraging him to push his fitness to the next level for some time. Best decision we have ever made and each year we get stronger and better on the bike. This allows us to continue to challenge ourselves with some beautiful climbing adventures, and we particularly love climbing the Victorian Alps when we can get there. “RIDE!, RIDE! Just RIDE!! 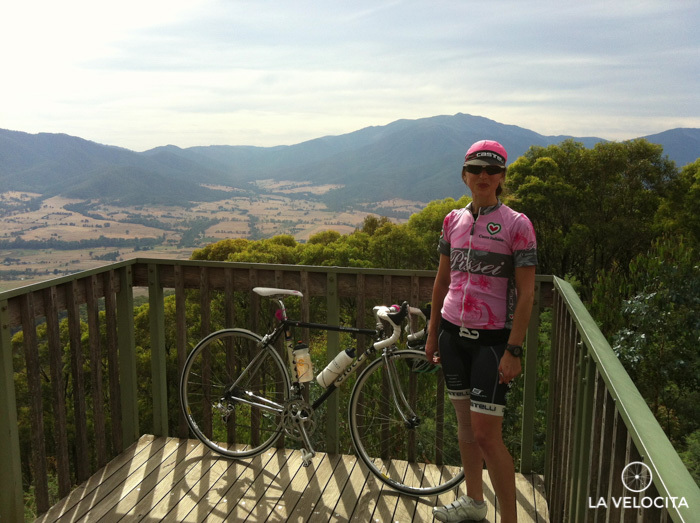 !” My husband was screaming at me to peddle faster on our return trip from Mt Buller back to Mansfield. We had done 80km’s by that stage with a fair amount of climbing so I was quite fatigued. I turned around to ask why only to see him acting like a mad man waving one arm around whilst trying to hold onto the bike with the other. I then realised what all the fuss was about when I glanced upwards and looming above him was an angry magpie swooping us! It was November and that is Spring in Australia which means breeding season, so the Magpie was simply protecting his territory and/or his young. Unfortunately, he saw us as predators and was certainly not too happy with us riding past. To make matters worse it seems that there was more than one magpie we upset on that section of road. I am quite certain I hit a PB that day, it is amazing what a hit of adrenaline does to your speed on the bike. And who only knows what the passing by drivers thought of us. My husband and I sit and laugh about it now. It is time spent with my husband doing something we both love, together. It get’s me outside and allows me to see beautiful places in Victoria. It enhances my fitness and that is important for my long term health. It does wonders for my blood sugar levels and regular exercise is so important for diabetics. I can eat lot’s! I love cooking and eating good food so cycling just encompasses that component of helping me keep healthy. Amber Johnson is the Weekly Rider! She's a Lover of hypotheticals, riding her bike, a quality pun, lifting heavy things and having a laugh with good mates. After a few years away from the racing scene Jessica Lane is back and loving it! Riding for BikeBug, she's planning to make her mark on the 2015 National Road Series. La Velocita Caught up with Jess to find out why she loves to ride at December's Shimano SuperCrit hosted by SKCC. Meg Gillmer is the La Velocita Weekly Rider! Meg is better known as 'The Wholesome Athlete' bringing together nutrition and cycling... a perfect combination. Meg is also the newest member of the La Velocita team and will be bringing you articles on nutrition and cycling challenges and adventures!